Ireland is a small island with over 200 offshore islands off the north-western shore of the European mainland. Our nearest neighbours are England, Scotland and Wales. Its total area is approximately 20,000,000 acres or 8,000,000 Hectares. However, its seabed ownership up is quite an extensive one. 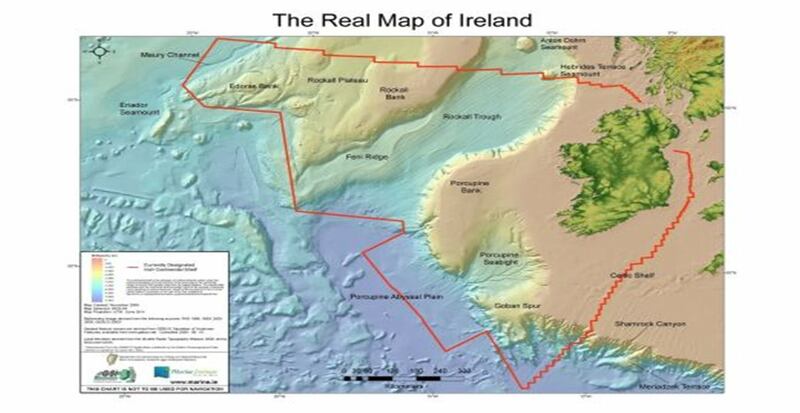 Take a look at the “new” map of Ireland, the image which shows we own quite a bit more of the sea floor than previously thought. The final results of a seabed survey, carried out by the Marine Institute and the Geological Survey of Ireland, are still being finalised, but Ireland can lay claim to 220 million acres of seabed — gaining a significant amount of territory, primarily off the south-west coast. It has often been pointed out that Ireland outline is roughly saucer shaped with mainly flat land in mountains forming much of the perimeter. Consequently, it is difficult for water to drain away from the centre leaving many lakes, marshes and bogs. True the fact that the main island is surrounded by sea influences the climate and the attitude of its inhabitants and confers both advantages and disadvantages economically and politically – the rocks, the soils and ingenuity of its people in the utilization of its natural resources was and still is critical for the survival of its inhabitants. Many of our offshore islands have lost their total population over the years, with the result only a small number are now lived on. The length of the mainland coastline depends on the detail with which it is measured. 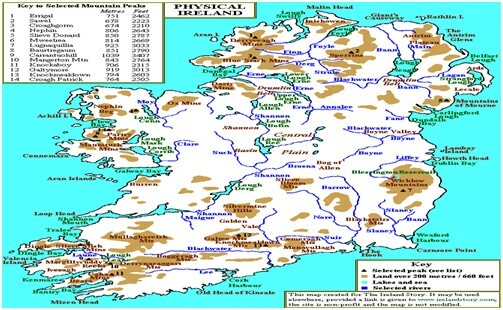 However, an estimate offered by the Ordnance Survey of Ireland puts the total length around Ireland at 3171 kilometres. We have a varied coastline, but a basic distinction may be made between westerly shores exposed to the full force of the Atlantic Ocean and the more sheltered east coast. Actively eroding cliffs are widespread along the west coast, for example at the famous Cliffs of Moher in Co. Clare and at Croaghaun on Achill Island, Co. Mayo. The Cliffs of Moher above – rise 120 meters (390 ft) above the Atlantic Ocean and reach their maximum height of 214 meters (702 ft) just north of O’Brien’s Tower, eight kilometres away. The views from the cliffs attract close to one million visitors per year. On a clear day, the Aran Islands are visible in Galway Bay, as are the valleys and hills of Connemara. The cliffs consist mainly of beds of Namurian shale and sandstone, with the oldest rocks being found at the bottom of the cliffs. It is possible to see 300 million year-old river channels cutting through, forming unconformities at the base of the cliffs. The rock structure out of which the Irish landscape has been carved have not only an extent in space, but also a history in time. Although Precambian rocks dating back to more than 2000 million years have been identified in coastal sections at Rosslare and Kilmore Quay in Wexford, the most extensive older rock formations in the country are represented by those of the lower Palaeozoic and the youngest (60 million years ago) by those of the Tertiary Period. The Palaeozoic era consists of Cambrian, Ordovician and Silurian rocks (mainly shales). They are usually metamorphosed and trend in a south-westerly direction. The Cambrian and Ordovician rocks occur in south-east Wexford and east Wicklow. 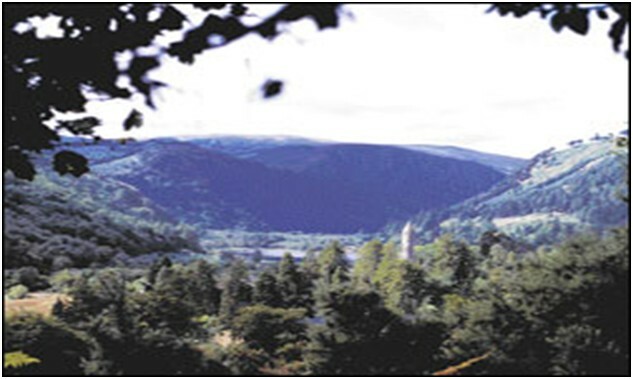 The backbone of the Wicklow Mountains is dominated by Leinster granite, which was formed following the collision of two continents c.445 million years ago..Large areas of molten rock were pushed upwards into the surrounding mudstone and sandstone rocks of the earth’s upper crust. This molten rock cooled slowly beneath the insulating surface of the upper crust of the earth, allowing the large crystals of quartz, mica and feldspar (which forms granite) to develop. The heat from this caused the surrounding rocks to ‘bake and thus, shales were converted to mica schists; mudstones to slate; and sandstones to quartzite; by a process known as metamorphosis. At the end of the Caledonian (Mountain Building) period, folding took place in an east-west direction and has given rise to southern Munster in particular, its typical east west trending hills and valley topography. The Old Red Sandstone occupies much of the area south of a line from Dingle Bay to Dungarvan and also the main component rock type of the Commeragh, Knockmealdown, the Galtees, the Slievenamon Range, Slieve Beragh, Slieve Aughty and the Slieve Blooms. It also stretches from Pomeroy in Tyrone to Irvinstown in Fermanagh. 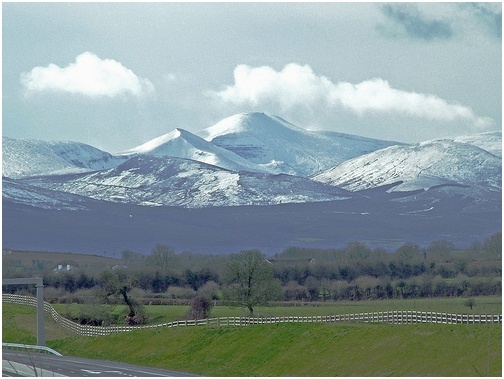 Looking north across the Mitchelstown valley to the Galtee Mountains, which lie in an East-West direction. Limestone remains in the valley but has been stripped off the Mountain-ridge where the more resistant old red sandstone stands up. Mithelstown- Cahir Valley with the Galtee Mountains in the background. The underlying rock in this area is limestone, which had been eroded from the mountain leaving the much more resistant Old red sandstone . The soils are made up mainly of acid brown earths, with moderate rainfall, which give possibility of growing a wide range of crops. Towards the end of the Carboniferous (laying down of coal deposits) Period, about 300 million years ago, the sea levels dropped again and a large area of tropical swamp emerged, stretching around most of the equator. The Carboniferous Period created more than 40% of our rock surface area. The entire Central Plain of Ireland is an extensive sheet of Carboniferous strata pierced by only a few inliers. Most of this is calcite-rich limestone which stretches from Fermoy in the south to Dungannon in the north and from Galway/Clare coast in the west to Dublin/Meath/Louth in the East. At the later stages of the Carboniferous Period, the sediments became more laden with organic debris and with silt clay particles. This resulted in the formation of the Upper Carboniferous shales, Coal Measures and Millstone grits. These occur most widely on the Castlecomer Plateau, the Slieveardagh hills and in North Kerry, West Limerick, West Clare and in Leitrim and Fermanagh. Because they are rich in clay and silt, they usually weather to form poorly-drained,and difficult soils. One of Ireland’s most characteristic features is bog, covering 3 million acres or 1,200,000 hectares (1/6th) of the island, Ireland contains more bog, relatively speaking, than any country in Europe except Finland. Peat was traditionally manually harvested by operating cutaway bogs. This method (still privately used today) consists of sods being vertically cut from the side face of a peat deposit. The midland peat can be up to 30 feet (10metres) in dept and lying on limestone rock. The peat started to be formed after the ice age. The annual vegetation died off each year and composted as peat. Technology was derived to mechanically cut and remove layers of peat from blanket bogs. Today, equipment is used to remove tonnes of peat each day at suitable times of year (rainfall is a significant variable in peat harvesting). Almost all the peat now harvested is milled peat, scraped from the surface of the bog by tractor-towed pin millers. The milled peat is ridged into small piles which are then transferred by harvesters into large piles running parallel along the bog. Railways are laid alongside each pile, the pile loaded into trains and the railway lifted and moved to the next pile. This is the ‘Peco’ method of working. A few bogs use the ‘Haku’ method whereby the milled peat is loaded into tractor-towed caterpillar-tracked trailers and deposited in a single heap at the edge of the bog adjacent to a railway line. Each year, the network of drainage ditches is deepened by a few inches before the next harvest. Bord na Móna have developed a number of products which were novel developments in their time. Today peat briquettes replace sods of raw peat as a domestic fuel. These briquettes consist of shredded peat, compressed to form a virtually smokeless, slow-burning, easily stored and transported fuel. The first milled peat plant run by the Bord was financed with a loan of £500,000 from Guinness in 1957. Another product developed was peat moss, a combination of peat and soil for use in the garden – particularly in pot plants. The company also supplies peat to power stations of the Electricity Supply Board and its own power station Edenderry Power . 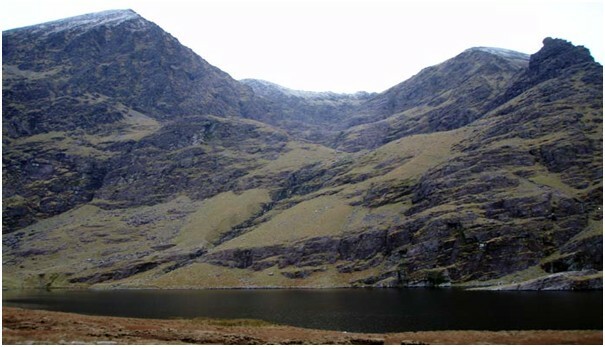 Carrauntuohill mountain is at the south-easterly corner of Ireland. It is the highest mountain in the country. There is a rise 2000feet sheer from the sea and make a spectacular sight. The highest point, however, is Carrantuohill, a mountain in co. Kerry, which climbs to 3414 ft/1050m. The range is composed of red sandstone, which has been substantially modified by geological ice action, notably in the form of sharp peaks and corries (scooped-out basins. On the Northern Eastern corner of Ireland (Co. Antrim) rests the Giant’s Causeway (known in Irish as Clochán an Aifir or Clochán na bhFómharach) is an area of about 40,000 interlocking basalt columns, the result of an ancient volcanic eruption. It is located in County Antrim on the northeast coast of Northern Ireland, about three miles (4.8 km) northeast of the town of Bushmills. It was declared a World Heritage Site by UNESCO in 1986, and a National Nature Reserve in 1987 by the Department of the Environment for Northern Ireland. In a 2005 poll of Radio Times readers, the Giant’s Causeway was named as the fourth greatest natural wonder in the United Kingdom. The tops of the columns form stepping stones that lead from the cliff foot and disappear under the sea. Most of the columns are hexagonal, although there are also some with four, five, seven and eight sides. The tallest are about 12 metres (39 ft) high, and the solidified lava in the cliffs is 28 metres thick in places.